Posted 6/28/2015 5:31am by Sam Bellamy. The blueberry fields will be open Monday , Tuesday , Wednesday Thursday mornings from 7:30 to 10 am. Please bring a container to put the berries in after you pick.The fields will most likely be open Friday and Saturday as well but I need to see how they are before I commit to opening them on those days. It is the July 4th week rejoice, cherish the good, make memories that you'll always be glad of and may your fun be a benefit to others. Posted 6/26/2015 8:01am by Sam Bellamy. We currently are selling some of the best white sweet corn. You may consider it to be the best you have eaten. This "summer sweet" variety is as good a corn as I can remember. I encourage you to get while you can. Posted 6/25/2015 5:53pm by Sam Bellamy. Good news. The blueberry field will be open Friday and Saturday mornings. There are some really nice berries to be picked! Open at 8 am to 9:45 am. If you come early please wait for someone to get there. We may be able to get started at 7:30 am if we can get enough other chores done ahead. It is recommended that you bring something to take your berries home in. Thanks! Posted 6/21/2015 5:09pm by Sam Bellamy. The blueberries are beginning to come through so you can anticipate more PYO days and times. The field is scheduled for Tuesday morning ( June 23 ) and Thursday morning ( June 25) for the next two pickings. It looks as if Friday ( June 26) may get the nod instead of Saturday due to much needed rain. The field opens at 8 am Tuesday. If you come ahead of time please wait for someone. It may well be we will have someone ready at 7:30 but do wait for them. There have been some very nice berries picked so far. We are just getting started with tomatoes. The heirlooms are beginning so for the serious tomato lover pay attention this is your notice. this hot weather is hard on tomatoes. With the temperatures remaining so high for so long it often affects fruit set. The extreme heat affects corn pollination as well. So don't take summer vegetables for granted! Enjoy them while and when you have them. Squash , cukes , okra and beans are coming in now. Peaches, plums are in with figs coming in a few weeks. The Bakery has peach short cake, blueberry pies, ice cream , milkshakes and other cool desserts to help make the summer a flavorful one. Posted 6/17/2015 1:04pm by Sam Bellamy. The blueberry field will be open Thursday morning 8-9 am. We will be picking in the back field. The price is 2.30 / lb. Please bring a container to put your berries in after you pick. We plan to open the front field Saturday 8- 9. The bakery has peach short cakes , ice cream, eclairs , milkshakes and more! Posted 6/14/2015 7:26am by Sam Bellamy. The blueberry field will be open from 8 am to 9am Monday morning. This is the first picking and is on a short time frame. We need to have the best quality berries we can so we don't want to over pick fruit that looks blue but needs to reach their full potential. The price is 2.30 / pound. We will be in the field closest to the market. Doug will be at the field cart. The next PYO date should be sometime this week so keep posted. Posted 5/22/2015 12:53pm by Sam Bellamy. The schedule for the Memorial weekend here at the farm is to be open Saturday and Monday as well. Sarah will be at the Myrtle Beach market Saturday at least in the morning. Strawberries are winding down but we are picking our high bush blueberries , the squash and cukes are coming along well, the watermelons and cantaloupes look good and the tomatoes make me smile at this stage. Things are looking up. Even four of the five sheep have been sheared. Have a great memorial weekend. Posted 5/10/2015 10:37pm by Sam Bellamy. It has been quite an adventure this year. The strawberry crop has been off for everyone but especially so for us. 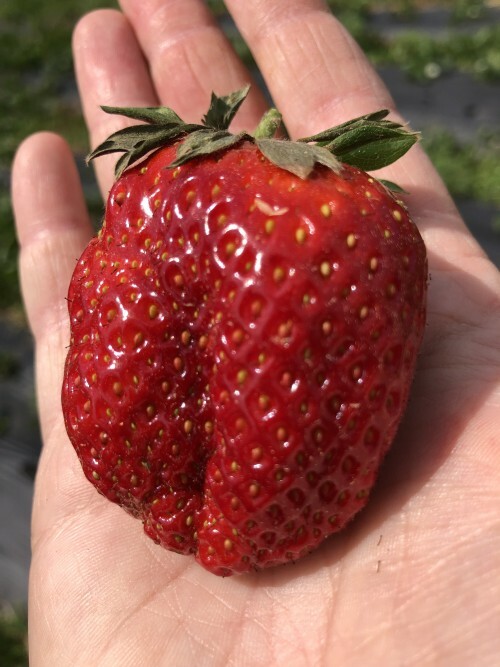 We miss PYO very much and one reason is there are some of you that we see about once a week during the strawberry season. Naturally we miss the needed income as well. For the second year Spring has been pushed further into summer. The rain kept up keeping planting off schedule. We have worked to get the tomatoes set out and they look good so far. Thinking of rain and water, this year we aimed at getting the watermelons ready before July . They are out and have a good start. We have planted more seedless melons and added some new varieties. We even planted some Charleston grays. This is a variety that has a rich history in this area. It was a watermelon that my grandfather was very fond of. My grandfather was known for his watermelons. We still have more plantings of tomatoes /peppers, beans,squash & cukes and melons to go yet. Meanwhile, the organic broccoli, kale, and kohlrabi are looking real good. The cabbage is coming along and we could be cutting some by the end of the week. The potato crop looks very interesting. I don't have time to take pictures but there have many times I wish I could. The organic potato crop looks fantastic. If you want organic vegetables please email or call so we can hold your order. Most organic production is going to Myrtle's Market where people are asking for it. So we will have to keep on the sunny side. There are some good things coming up, literally! Posted 5/8/2015 8:51pm by Sam Bellamy. The weather is affecting us all as Ana churns off the coast. Sarah will be at the Myrtle's market Saturday morning. She will have strawberries and vegetables. Posted 5/1/2015 12:44pm by Sam Bellamy. It has been a testy spring but many things are beginning to brighten up. The strawberries are beginning to get more volume. This means there are more at the market. PYO is still uncertain. There was considerable deer damage done in late December that has this year's crop way off the norm. Now is the time for kohlrabi, kale, green onions, garden peas. Other cool season crops will be joining these a later. We are growing tomatoes, watermelons ,corn, squash, beans, cucumbers and more. The blueberries are looking very good this year.